Pendley's Clock Repair opened in Hickory in 2000. I am a graduate of the National Association of Watch & Clock Collectors, Inc. (NAWCC) School Of Horology. I am a national member of NAWCC and past president of the NAWCC Carolinas Chapter 17. 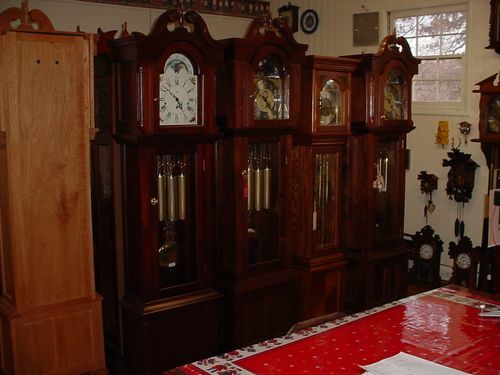 I service all types of mechanical Clocks.... Sligh, Howard Miller, Hentschel, Ridgeway, Jungans, Hermle, Herschede, Seth Thomas, Ansonia, New Haven, Sessions, Waterbury, Welch...You name it... All types...Mantel, Wall, Cuckoo, and Floor clocks(grandfather). I do not repair or service watches. CLOCK, n. A machine of great moral value to man, allaying his concern for the future by reminding him what a lot of time remains to him.